Features: 100% brand new with high quality Compatible with all Mega Drive 1, Genesis 1 & Master System Only Make playing your favourite console even easier with a new RGB Scart cable. Enjoy better picture quality on modern TVs than with traditional RF or AV connectors. High quality, shielded cable for great picture and sound performance. Simply connect to your console and plug the Scart connector into your TV. ABOUT THE RETRO COMPUTER SHACK. No need to tune in your TV, just select the AV channel, that you have plugged the lead into. and set the TV for a Normal (4:3) Aspect Ratio picture (not 16:9 Widescreen). ABOUT THE RETRO COMPUTER SHACK. No need to tune in your TV, just manually select the AV channel, that you have plugged the lead into,and set the TV for a Normal (4:3) Aspect Ratio picture (not 16:9 Widescreen). 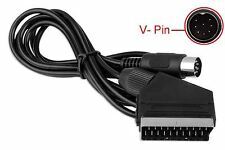 4.5 out of 5 stars - Sega Mega Drive 2 II High Quality RGB Scart TV Lead Video Cable. 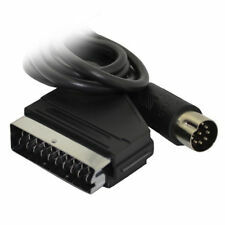 5 product ratings5 product ratings - Sega Mega Drive 2 II High Quality RGB Scart TV Lead Video Cable. Connects the sega console system via RCA-style. Includes an S-Video connection for added picture clarity when being used with S-Video compatible TV. Provide composite video & audio output for viewing on a TV or monitor. RGB lines have the correct components for optimal brightness level and picture quality. Stereo sound, taken by extra lead which connects to the audio port on the front of your console. High quality cable with copper wire spiral shield to help prevent external interference. Multi-region Dreamcast consoles. RGB lines have the correct components for optimal brightness level and picture quality. 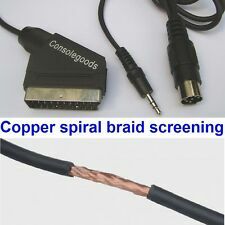 High quality cable with copper wire spiral shield to help prevent external interference. Sega Mega Drive II SCART AV Cable - Best possible picture! Sega Mega Drive II SCART AV Cable - Best possible picture!. Dispatched with Royal Mail 2nd Class. This is theRGB AV Cable for Sega Saturn. SmartPhone Accessories. Enables displays with natural and VIVID Colors. Tablet Accessories. Garmin Accessories. Fitbit Accessories. A brand-new RGB SCART lead with stereo audio for the Sega Mega Drive 1 (ALL Regions) and Sega Genesis 1 (USA). Our cable features components installed for correct signal and colour control, a full 2 metres of screened flexible video cable & full stereo audio out connection for the best sound and video experience. 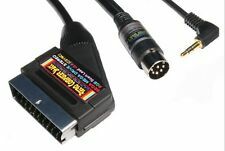 Our RGB cable is the best way to connect your Sega Mega Drive 1 or Genesis 1 to your RGB-enabled Scart TV and is a much superior picture improvement over the standard aerial cable. 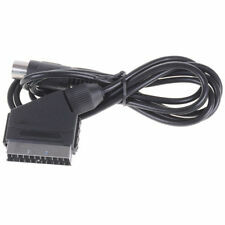 A brand-new Scart audio/video (AV) lead for the following Sega consoles: Sega Mega Drive 2 (UK) and Sega Genesis 2 (USA). Our cable features a composite video & stereo audio out connection via a standard scart plug and is 1.5 metres in length. Our cable has a correctly designed and moulded video plug with strain relief. For Sega Genesis 2. For Sega Nomad. High quality cable with copper wire spiral shield to help prevent external interference. The audio and video wires are also screened from eachother inside the cable. RGB lines have the correct components for optimal brightness level and picture quality. High quality cable with copper wire spiral shield to help prevent external interference. Bank: BACS or over the counter. 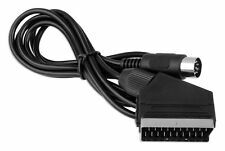 A brand-new composite video & audio AV SCART lead for the following Sega consoles: Sega Mega Drive 1 (UK), Sega Genesis (USA) and Sega Master System 1 (UK). Connects audio and video from the console directlt to any scart TV - no need for any tuning. Cable is 1.5 metres in length. Please note this is not an RGB cable. .
Sega Master System 1 (UK). For the following Sega consoles Sega Genesis (USA). Correct 8 pin U Din for RGB video port. Tools & Hardware. 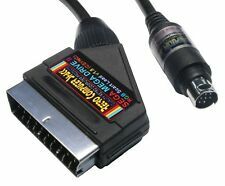 Cables for classic computer systems and ganes consoles. Our range of novelty car signs are all produced exclusively by us and make an ideal novelty gift for friends and family. 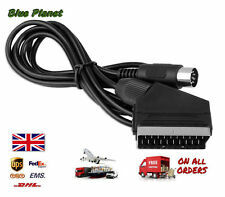 A brand-new fully-wired RGB Scart lead for the following Sega consoles: Sega Mega Drive 2 (UK) Sega Genesis 2 (USA)Our cable features a composite video & stereo audio out connection via a standard scart plug and is a full 2 metres in length. Our cable has a correctly designed and moulded video plug with strain relief unlike others for sale. Superior picture improvement over standard aerial cable!. Compatible with all Mega Drive 1, Genesis 1 & Master System Only. Make playing your favourite console even easier with a new RGB Scart cable. Enjoy better picture quality on modern TVs than with traditional RF or AV connectors. High quality, shielded cable for great picture and sound performance. Simply connect to your console and plug the Scart connector into your TV. Has a C Pin connector to more easily insert the cable into the console. Cable Length approximate 180 cm Weight 92g Colour Black Type SCART Cable Platform Sega Mega Drive Model Sega Genesis AV Connection SCART Brand Unbranded/Generic MPN HD608415840015 EAN 0713239784800. 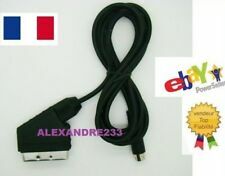 Scart to HDMI Converter Scaler 1080p for Amiga, Atari, SNES, Megadrive etc. It is with real scaler function, and output resolution is fixed at 720P or 1080P to avoid compatibility problem. So it need to be modified. HDMI output: 720P/60Hz, 1080P/60Hz;. How to buy. Pick up in Gloucester. Compatible with all Mega Drive 1, Genesis 1 & Master System Only. Make playing your favourite console even easier with a new RGB Scart cable. Enjoy better picture quality on modern TVs than with traditional RF or AV connectors. High quality, shielded cable for great picture and sound performance. Simply connect to your console and plug the Scart connector into your TV. Has a C Pin connector to more easily insert the cable into the console. Cable Length approximate 180 cm Weight 92g Colour Black Type SCART Cable Platform Sega Mega Drive Model Sega Genesis AV Connection SCART Brand Unbranded/Generic MPN HD608415840015 EAN 0608415840015. Superb quality Audio & Video. 6ft In Length. 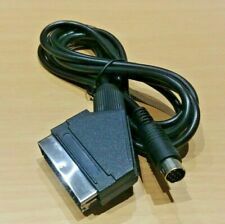 Sega Mega Drive 2 RGB Scart Cable. Condition is Used. Dispatched with Royal Mail 1st Class Large Letter. Connects the sega console system via RCA-style. Provide composite video & audio output for viewing on a TV or monitor. Its a 3rd party cable but good quality. A brand-new composite video & audio AV SCART lead for the following Sega consoles: Sega Mega Drive 1 (UK), Sega Genesis (USA) and Sega Master System 1 (UK). Connects audio and video from the console directlt to any scart TV - no need for any tuning. Cable is 2 metres in length. Please note this is not an RGB cable. . Compatible with all Mega Drive 1, Genesis 1 & Master System Only. Make playing your favourite console even easier with a new RGB Scart cable. Enjoy better picture quality on modern TVs than with traditional RF or AV connectors. High quality, shielded cable for great picture and sound performance. Simply connect to your console and plug the Scart connector into your TV. Has a C Pin connector to more easily insert the cable into the console. 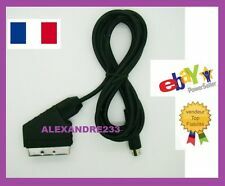 Cable Length approximate 180 cm Weight 92g Colour Black Type SCART Cable Platform Sega Mega Drive Model Sega Genesis AV Connection SCART Brand Unbranded/Generic MPN HD608415840015 EAN 0657472205206. Compatible with all Mega Drive 1, Genesis 1 & Master System Only. Make playing your favourite console even easier with a new RGB Scart cable. Enjoy better picture quality on modern TVs than with traditional RF or AV connectors. High quality, shielded cable for great picture and sound performance. Simply connect to your console and plug the Scart connector into your TV. Has a C Pin connector to more easily insert the cable into the console. Cable Length approximate 180 cm Weight 92g Colour Black Type SCART Cable Platform Sega Mega Drive Model Sega Genesis AV Connection SCART Brand Unbranded/Generic MPN HD608415840015 EAN 0713239787863. Only for Sega Genesis 2. - Copper wire spiral shielding/screening, to help prevent interference. - Core Material:Copper. - Main Purpose: Video, Audio Transmission. - Line length: 1.8m. Cable length: About 1.8m / 5.91ft. Anyway we will try our best to avoid this kind of thing. Due to the light and screen difference, the item's color may be slightly different from the pictures. Good durability, practicality and appearance. Sega Nomad. Sega Genesis 2. Factory produced cable with moulded plug. Much better screen quality than normal AV cable. Cable Length: Approx 180cm / 6FT. Note: Due to the difference between different monitors, the picture may not reflect the actual color of the item.